When joining two lengths of flex pipe should there be a metal piece or can they just be taped together? Where you're butting two pieces together you definitely need a metal sleeve in there. Do I need air return in basement? Can I put cold air return in basement near ceiling! Yes, you can, but better to put it low. Insulated flex ducts should be attached to the floor/ceiling boots using zip ties. My system has return air filters downstairs at the register grills and there is a 1" filter directly on the unit upstairs. Should I run filters on both or just one? Filters won't hurt anything. Use them on both systems to keep the A-coil cleaner if nothing else. How often they get changed depends on how much dust and dirt is in your house. How to stop neighbors from listening through ductwork? What is the minimum distance from the end of a trunk, when adding a take-off? For proper static at the end of the duct, it is 18", but in a real live, you can set a take-off in any available place, except on the end cap. Can I relocate my return air grill for your furnace? For my furnace? C'mon, of course not! I'd like to move the floor vent in my dining room to the wall, any major issues with doing that? The wall is an outside wall, would the sill plate intefere with the ability to connect to the duct work in the basement below? The most common air filter used in residential heating and air conditioning systems are pleated air filters and they often don't fit well into the return grill or air handler. Return air, like electricity and water, takes the path of least resistance and the path of least resistance is often around the filter instead of through it. Unfortunately when air passes through these narrow spaces it can cause whistling or even hissing noises that quickly become very annoying. Ensure your air filter is the proper size for the application. This often means you have to buy custom sized filters instead of the common sizes supplied at hardware stores but the better the fit, the less likely it is that air will pass around the filter. In the return grill or the filter rack, which is often difficult to reach, install weather stripping or foam around the edge of where the filter sits to create a tighter fit. Use less efficient filters. Pleated filters have MERV Ratings and the higher the number is the greater the resistance to air flow. Unfortunately, a less efficient filter won't filter the air as well. Change your filter more often. If you only begin hearing noises after the filter has been installed for some time, maybe you are not changing your filter often enough. As dirt builds up on the filter airflow resistance increases and this can result in air passing around the filter instead of through it. Often when return grills are mounted in the ceiling and the filter is loose, it gets sucked up against the duct opening causing a thud every time the fan starts. This can be corrected by building up the inner surface that the filter hits against so that the filter fits firmly into place and there is no space between the filter and the duct opening for the filter to move. This is certainly not every potential problem that may cause your filters to be noisy but it will get you thinking and help you to solve the most common problems you may encounter. Furnace filters are a very important part of a regular maintenance program. Replacing them often will reduce operating costs and allow your heating or air conditioning system to operate more efficiently. Here is how looks like a blower and AC coil in your furnace if you forget to change a filter! Here is an unusual install, it’s nice, clean, but how does the filter system affect air flow? So we went out to this couples' house. 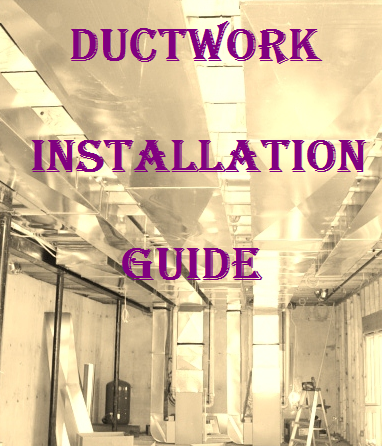 They wanted to replace all of their ductwork with aluminum flex ductwork. The lady that lives there suffers from Sarcoidosis of the lungs. Sarcoidosis is a little understood condition that can affect the lungs and can cause death. For them, air quality considerations were very important. When we looked under the house we saw that they already had another contractor install a York furnace, electronic air cleaner and UV light. I was a little bit concerned because they didn't have any non-mechanical filtration for the whole house. I'm not at all a fan of electronic air cleaners - when they break, which they always do quickly, these people would have no real filtration. So we recommended the Lennox Healthy Climate MERV 16 pleated paper filter and a filter plenum for the return air that we could put a 2" thick pleated paper filter in. We have found that pre-filtering reduces the frequency that the expensive MERV 16 filters needs to be replaced if there is enough return air to do so. We connected everything with sheet metal adapters that we made, re-installed all of the other stuff that was already there and increased the size of the return air (one 16" duct and a 10" duct for an 80k BTU 3ton blower furnace) to allow for adequate CFM's and air velocity to clear all of the filtration. We also replaced all of the ductwork with aluminum flex ductwork but that isn't particularly exciting so I didn't take any pictures of that. So, this is a beautiful work but I would have considered adding a very large section of return duct with a number of bag filters to increase the cleaning effect and minimize the pressure drop.